Happy middle of the week. 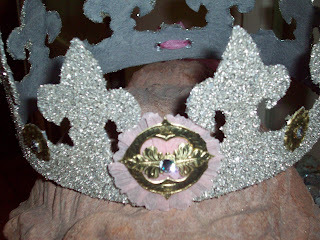 I have been up to my royal elbows in glitter! 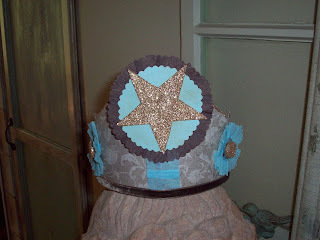 Here are some of the crowns I have been working on. I had to replace quite a few for Garden Memories, as many of them were sold this past Saturday. 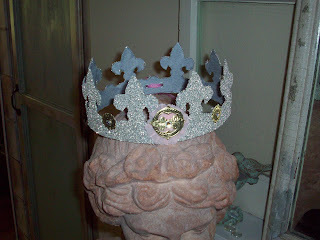 We cannot leave Her Majesty Barbara without any crowns. In between all of these, I got a few special requests from some really nice blog friends. If I haven't been around to visit you yet this week, well now you know why. 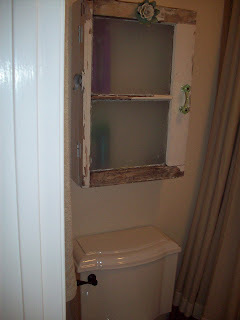 I just wanted to show you the new/old cabinet I found for my bathroom makeover. I needed a bit of storage above the toilet. 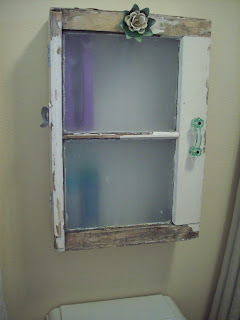 I found this great cabinet made from an old window. 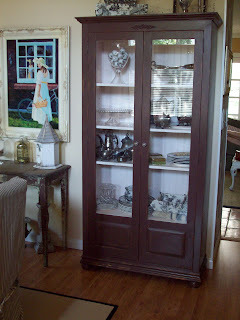 It came from my friend Karen's booth at American Home Antiques in Ventura. 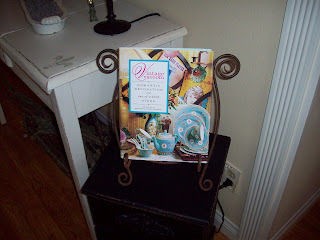 This great book stand from another garage sale, only $3. 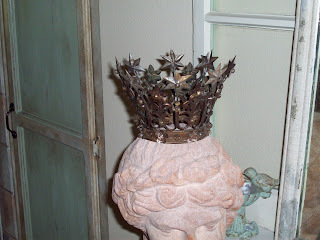 I got a reproduction French crown from Barbara's shop, Garden Memories. Not sure how many posts I will be doing this week. 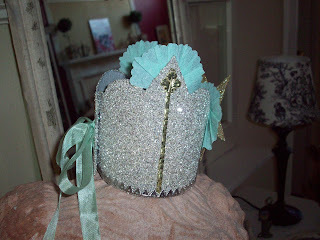 I have a busy week of glittering, and making many pieces for the shops, and fellow bloggers. I will be back on Friday for sure, as I am participating in the share your dress form day! So have a wonderful week, I will try to visit. Cones, Graphics, and an Award!! 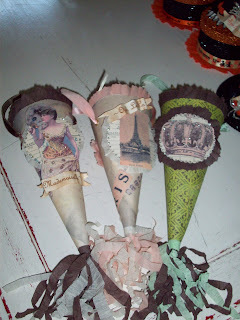 I wanted to show you some new cones I just finished using some lovely graphics from the Graphics Fairy. If you don't know Karen, she has a new and wonderful graphic every single day. If you want to check her graphics, go to my blog list, and click on the Graphics Fairy!!! You will love it!! She is a wonderful resource! Yesterday I was given an award from Kate of The French Nest. 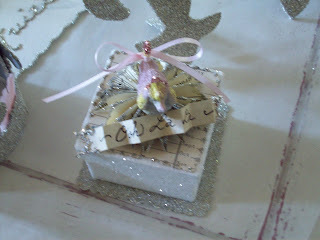 http://the-french-nest.blogspot.com/ It was so sweet of her to include me on her award list. Now I am suppose to choose 7 more blogs. Here is the problem, that I'm sure you all have from time to time. There are so many wonderful blogs, and talented people. I am going to mention some, and if you want to check their blogs, click on my blog roll. 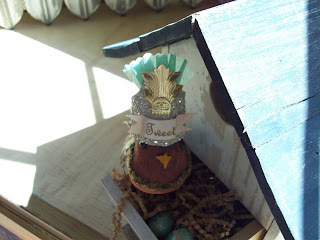 Jamie, of Simply Me Art, a wonderful blog, and she is a jewel. She makes the most wonderful vintage jewelry pieces, that are very hard to resist. She has an Etsy shop which you can get to from her blog. Then there is Margo/Robolady, the Junker extraordinaire. She has a great blog, website, and shop. She makes incredible items from junk!! Jennifer Grey of The Old Painted Cottage. 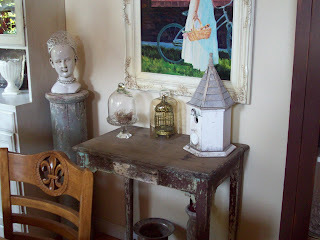 She is queen of shabby chic meets cottage!! Every month she features a new cottage for you to see. She has a wonderful website/shop. 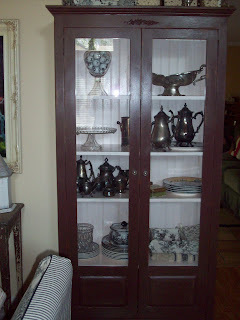 Pat of Back porch Musings is a master decorator, and story teller. 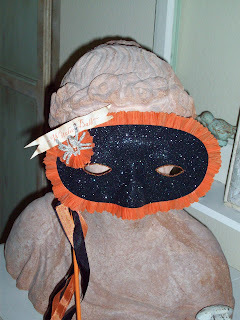 Susie Q of Rabbit Run is a wonderful writer, as is Liz of Mabel's House. Madai of Wrens Cottage. 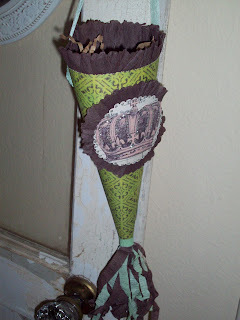 She has a wonderful Etsy shop, and makes beautiful banners! 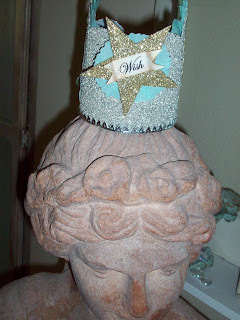 Ginger of Loves to Dream has wonderful tips, recipes, and websites. Rebecca of Wonders Never Cease, has a new wonder everyday, and is a wonderful writer. 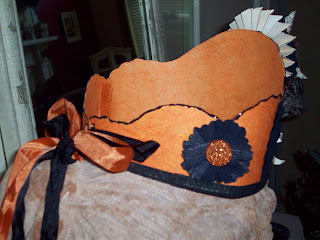 Nancy of Fete Et Fleur makes the most beautiful little crepe paper shoes. 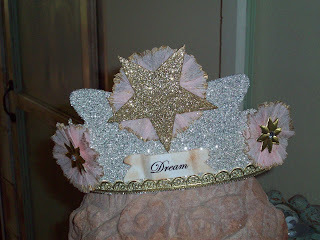 Donna O'Brien of The Ribboned Crown makes the most beautiful glittery crowns. The list goes on, and on. So you see why this is way too hard. Just visit all of the blogs on my list and you will see why, all of these woman deserve awards!!! 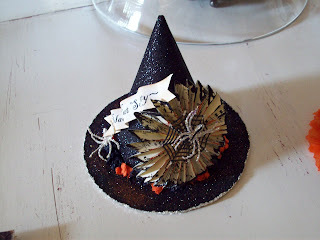 Have a wonderful day, and enjoy the blogs. Still Working on Orange and Black!! Hope you all had a nice weekend!!! I had a very nice, but busy weekend. We were helping our daughter with more house projects. She is trying to get everything ready for her upcoming house warming party in August!! 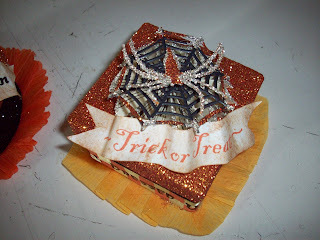 So here it is Monday again, and I am working on more Halloween projects. 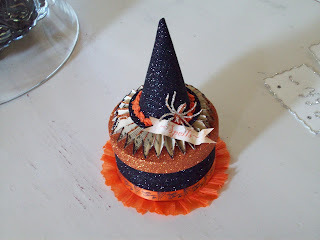 It is kind of weird to be working on Halloween in July, but it has to be ready for the shops in August. 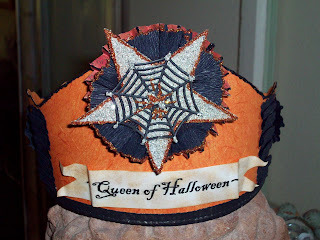 Anyway here is my new Queen of Halloween crown!! I used my garden bust/ lady for a model. I think she looks quite nice. 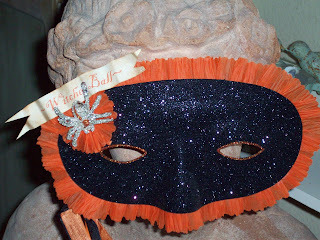 Here she is in her Witches Ball mask. I think she is ready for the ball!! Well I just wanted to stop by and say hello, and happy Monday. Top Ten Reasons I Haven't Posted Since Sunday!!! I have had a busy one!! Reason # 1 for not posting since Sunday. 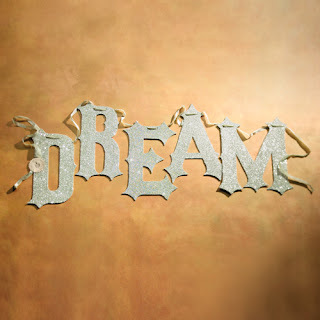 #2 Receiving this beautiful DREAM Banner from Madai that I ordered, and trying to figure out where and how I wanted to hang it. As soon as it's hung I will show you. 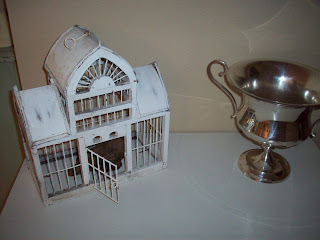 If you haven't visited Madai's blog, it's Wren Cottage. 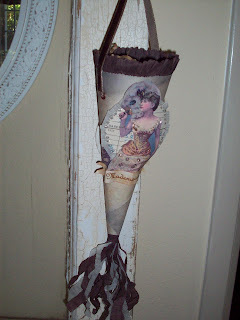 http://carolinawrencottage.blogspot.com/ Please visit her, you will love it. She has an Etsy shop too, WrenCottage6, if you want a pretty banner. #3 I got a sinus infection, and had to go to the DR. Feeling much better today!! Antibiotics are working, Yay!! 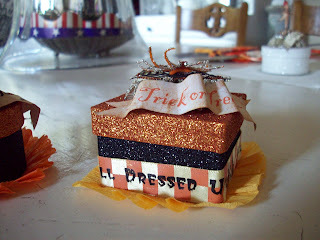 #4 These 6 Large Halloween boxes that I made. 3 have already found new homes. 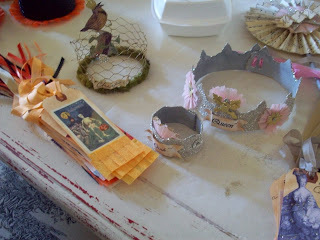 #'s 5-10 The rest of the pretties I made for Garden Memories this week!! www.gardenmemoriesgifts.com/ When things sell, I replace them with new ones. 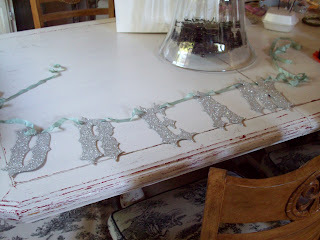 Now I am cleaning the house,(Mess I made from the glitter), and waiting to go to my daughter's house to sign for a delivery. My daughter Amanda had me up at the crack of dawn on Saturday for garage sales. There were so many that day. 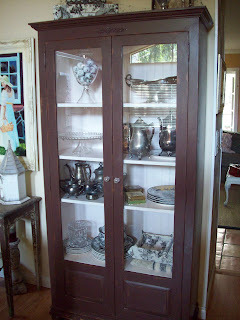 One of the last sales of the day, I found this pretty cabinet. My daughter also found some great stuff. She is really getting into the garage sales, since she got married, and bought a house. She is always amazed at what you can find out there. Now for my chair. This did not come from a garage sale, but an antique mall. We used to have a bigger chair in this corner, but we recently redid our master bedroom/bath, so we needed a smaller chair. I used a lot of linen in the redo. 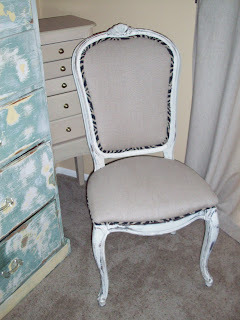 We spotted this chair that had already been recovered in a pretty linen fabric. It turned out to be really comfortable too. It wasn't a bargain, so my husband had to talk me into it. We actually went home, and I thought about it. 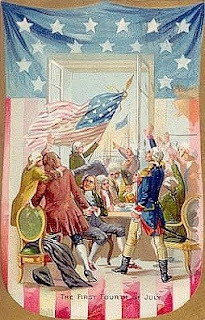 I had been exhausted from hosting 4Th of July the day before, so I went to take a rest on the sofa. When I woke up, my husband had gone back to the shop and bought the chair for me. I am so glad he did. It fit perfectly, and looks perfect in our redone room. Thanks again honey!!! Just another little view of my dining room. Hope you all have a great week ahead!! 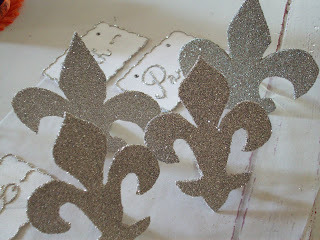 Glitter, Glitter, and More Glitter!!! Hi all, sorry I haven't been visiting you the last 2 days, but I am up to my eyes in glitter. Seriously, I always have it on my face, and it sticks to the sun screen, lotion etc. 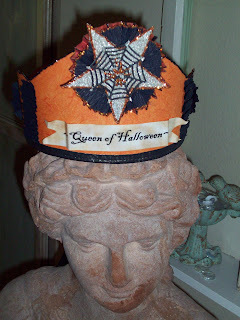 I have been working on more Halloween items for Garden Memories!! This is a large box, bigger than the ones I have in the previous post. 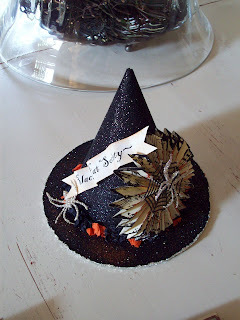 Here is a large witch hat. The one I brought to the shop got sold already, so I had to make another one. Each component is made by me, so it takes some time, but it's worth it. I think you can click to make pictures larger. I also have to keep replacing these poodle boxes. I think there are a lot of poodle fans out there. I made some new stand-up Fleur's too. I hope you are all having a great week, and I will try to visit your blogs soon. 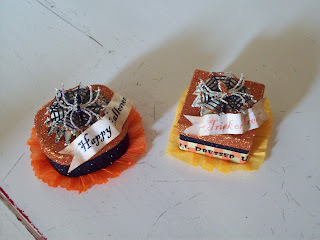 Just some pictures of my recent Halloween pieces. 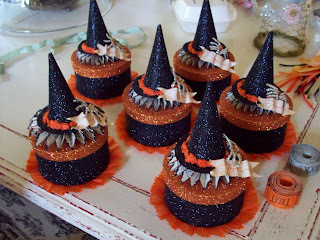 I have already started working on my favorite holiday. Garden Memories will be carrying all of these for Halloween. If you are ever interested in any of my pieces, just let me know. Not sure why these came out so small. Robyn, from Happy House of Haas wanted to see some of the things I have been working on. 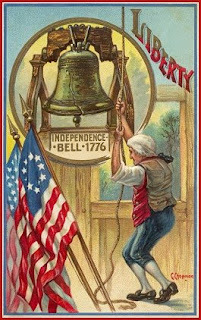 So this is what I was doing in between my remodel, and getting ready for the 4Th of July. 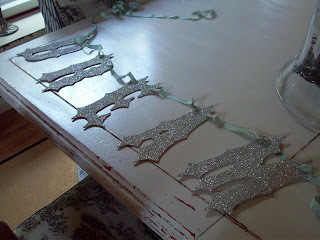 I have found my Dream garland. It will be handmade by a wonderful artist named Madai!! Her etsy shop is Wrencottage6!!! I thought you might be able to help!!! I am looking for the impossible. 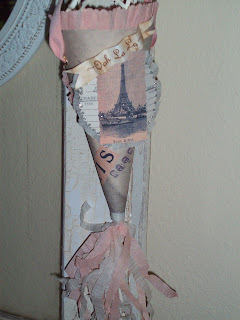 The 2004 retired Wendy Addison Large DREAM Garland. I am obsessed with finding it. I want it for above my bed. I did the room redo, and I need this to be the icing on the cake!!! I thought I would ask the help of my fellow bloggers!! I will even make it worth your while. I will award a prize to the person who finds where I can purchase this illusive item. I have scoured the Internet, and eBay only to come up without it. So if you can help me out let me know. I will be hosting a BBQ tomorrow, so I am taking today to get ready. Just wanted to wish you a lovely weekend. I will visit your blogs when I can.